In this file photo, pitcher Leandro Martinez #71 of Cuba throws in the top of the fifth inning during the World Baseball Classic Pool E Game Five between Netherlands and Cuba at the Tokyo Dome on March 15, 2017 in Tokyo, Japan. The Trump administration is moving to reverse an Obama-era ruling that allowed Cuban baseball players to sign with Major League Baseball teams in the U.S., NBC News reported. The Trump administration is moving to undercut a landmark agreement enabling Cuban baseball players to play on Major League Baseball teams, a senior administration official tells NBC News, by overturning an Obama-era decision that said Cuba’s baseball league is not part of the Cuban government. 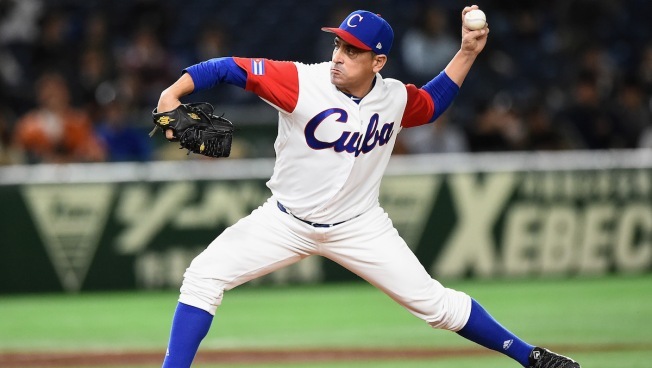 The administration has discretion to decide whether the Cuban Baseball Federation is too closely aligned with that country's sports ministry to allow independent agreements involving players. The Trump administration has worked to pull back from the closer ties to Cuba that were established during President Obama's tenure. "Major League Baseball has been informed of the dangers of dealing with Cuba,” the senior administration official said.